Home / TESTIMONIALS / Down Syndrome / Breaking Down Stereotypes: Gabriel is a Winner! It has been a few years since I have seen Gabriel although he has been a part of NACD since he was a little guy. His mom and I reminisced about how I kept pushing him and them out of their comfort zones to ensure that Gabriel progressed. He has always been a charming and pleasant boy, chatty and sociable. 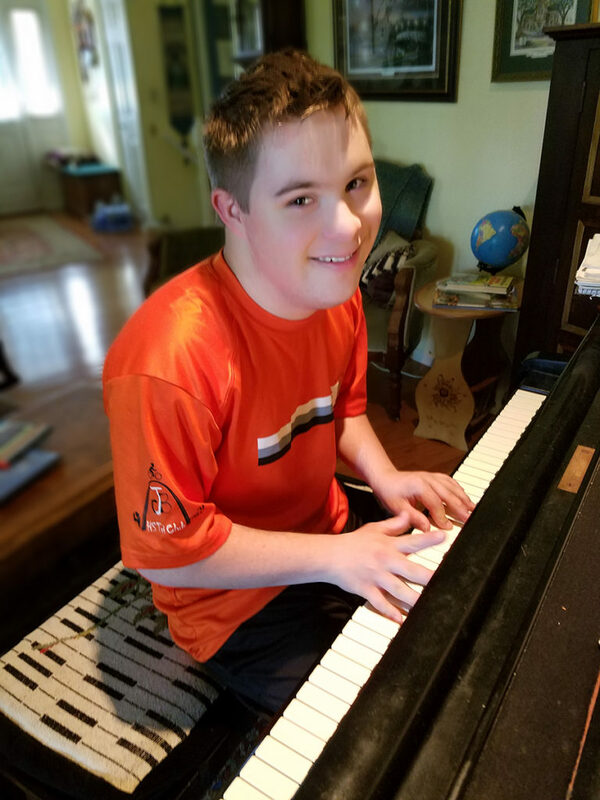 His parents started teaching him to play the piano early because they are a very musical family. He also learned to swim and ride a bike and enjoyed doing both. We often talked about the need to push him to take on chores and responsibilities at a fairly early age to teach him to use his attention and working memory as well as to get a sense of the need to stay on tasks until they were completed. It was always tempting to just let this pleasant boy play instead of pushing him to work and think hard. I see that I neglected to mention that Gabriel happens to have Down Syndrome. His parents wanted more for Gabriel than they had been told they could expect. That is what brought them to NACD and also what led them to push him to do better and learn more. In this energetic and outgoing family, Gabriel was expected and is expected to be involved and actively participate in their lives. 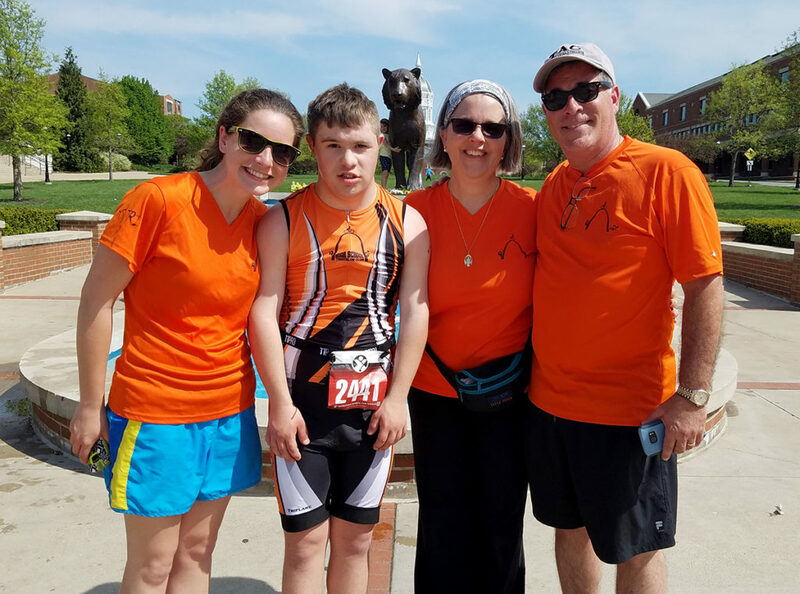 The punchline in this story is that Gabriel, now 17 years old, successfully participated in and completed a triathlon with over 400 other people, not special needs people but neurotypical people. He did the biking, the swimming and the running. He completed the course with no special accommodations, no extra help, no short cuts. When I asked him what he learned from this experience and all the work it took to prepare for it, he said, “You have to push through.” I get choked up recalling those words because they are so key to success, so vital to reaching goals. What a mature young man he has become to understand that this is what it takes! So how did it happen that Gabriel was able to complete such an arduous thing as a triathlon? His mom gives a lot of credit to the coach and the assistant coach of a program designed to turn essentially non-athletic high school students into fit and competitive athletes called the Tri Club. As you can imagine, it takes a lot of work. For Gabriel, there were no exceptions made to the work. The mom describes Gabriel swimming laps every day at the Y, 20 laps, 40 laps, constantly pushing his endurance and stamina. When the family went on vacation, their first thought was to locate a Y so that Gabriel could get his lap swims done. He also did spinning classes and core workouts four days a week. She graphically describes biking in rain and wind with temperatures in the thirties Saturday after Saturday and running every day. She stated that she felt as if maybe they were “crazy people” to be out there on old bikes in the rain and in the cold and then also biking down the side of the road in traffic or at the pool expecting more laps and more laps plus all of the running. They nonetheless persisted with the additional help and encouragement of the assistant coach. His mom would very much like me to add that Gabriel has been kept on a wonderfully healthy diet for his entire life which has certainly supported his good health and undoubtedly his good attention and demeanor as well. She has often been known as the “green smoothie lady” and is not reluctant to serve things such as pine nut “cheese” when you visit her home. His dad would point to the many responsibilities they have given Gabriel as great groundwork for completing tough tasks as well as their consistently high expectations of him. All of this work led to Gabriel participating in this huge event among 400+ other athletes. He is understandably proud of his accomplishment but is aware that it took a lot of work to be able to complete such a demanding set of tasks. What lies ahead for Gabriel? Perhaps a more difficult triathlon is in his future. So, moving from his recent victory, he then took on a second triathlon, this one was longer and more grueling involving lake swimming instead of pool swimming and included over twice as many participants. Moving forward we wish, Gabriel much success as he takes on every new challenge. In addition to training and participating in these events, Gabriel donates some of his time to helping to care for the elderly at a multi-care facility. He plays piano, assists individuals in recreational activities and helps with transporting them to various activities and meals. His charming personality is a most welcome addition to their day and his presence is always appreciated. Gabriel greatly enjoys helping them, so this is a win/win arrangement. So, with the motto of “push through” and a general ignoring of the alleged limits place upon individuals with Down Syndrome this young man with the support of his family has achieved a great victory for himself and for all those other kids and young adults who have had unreasonable limits set upon them due to a diagnosis. Gabriel is not his diagnosis. Gabriel is a young man in really good shape who is multi-talented and has learned that sustained effort pays off.